There’s a huge bias today towards bands using acoustic guitars, piano and swirling harmonies, especially British bands, towards the new folk categorization. It’s easy to put To Kill a King into the same category as Mumford & Sons. Or maybe Dry The River to match their edgier sound. I myself was ready to place them into this category after hearing their Word of Mouth EP. But Cannibals with Cutlery, the groups debut full-length has wiped away any last thoughts as to their genre. The band stands in a category all their own, blending pop, rock, folk and even classical music to create one of the most unique albums to come out so far this year. Usually it’s the music that jumps out at me first with a band like this. I mean, there is a lot going on: synths, pianos, bass, guitar, drums, harmony after harmony, strings. Basically, a lot for a five-piece band. Take their opening track, “I Work Nights and You Work Days” for example. It lulls gently into the album, using sparse but effective instrumentation like strings, quiet trumpet and a lone piano. Drums are completely absent from the song, only adding to the delicacy as Pelleymounter sings of the loving two-worlds relationship, “And though you are asleep, it seems so natural, to kiss you as the sun comes up.” This is the closest the album comes to a “typical” love song. The stories of these songs are not the simple loves songs of most bands today. Relationships aren’t just ended in heartbreak but tragedy. Violence and questions of character appear constantly as in the brutal and powerful song “Fictional State.” In one of the few songs to feature a female vocalist, singers make excuses for their broken love: “there’s no hole in my head, accusation I just ain’t the family type/falling short and you’ve got better plans, escape artist and you just undermine.” The song gradually progresses from a worried father singing over acoustic guitar and piano, to a cacophonous mix of blaring trumpets, drums and heavy guitar and the song come crashing triumphantly to an end. This is perhaps the greatest feat of the band. To Kill a King, progress with ease from quiet beginnings as in “Fictional State” and the refreshing “Gasp” to booming choruses that swell and surround. But for every old song, the band has new surprises. “Children Who Start Fires,” a metaphor for an unfaithful lover is a beautiful and clever acoustic number. And the closing track, “Letter to My Lover (The Dylan Fan)” makes a fitting end to an album that constantly shifts and twists. Never leaving you to catch a breath for one second, Cannibals with Cutlery touches on subjects few would touch in mainstream music these days, with a musical finesse most bands only dream of achieving. The album is out February 24th, but it’s currently streaming for free if you want more than just my words and the few samples below. Trust me, you don’t want to miss out on this band. Hey folk, sorry about the delay. It’s been a busy week getting adjusted to life in a new country, but hopefully posts will start to be on a more regular basis in the coming weeks. Today we’ve got a great new music video from To Kill a King. 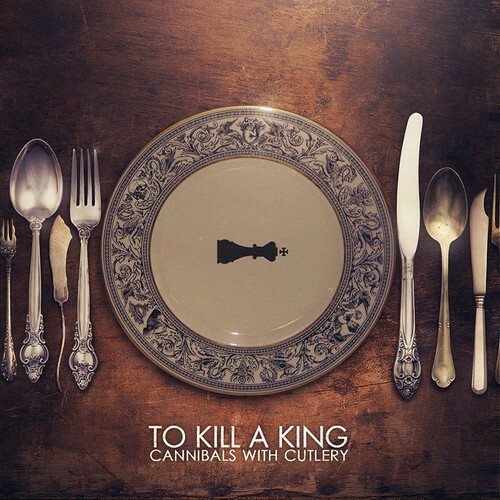 If you follow this blog, you’ll know that we love To Kill a King here and we’re very excited for their upcoming album Cannibals with Cutlery. This single, “Cold Skin” was previously featured in their amazing Ralph’s Balcony Session with an acoustic styling. Now, the song has come into it’s own as one of TKAK’s harder hitting, rock-leaning songs. Sure, there are still the group’s beautiful harmonies, but they’ve moved from the forefront of the songs to the background allowing a powerful guitar, electric organ and strong drums to take precedence. Lyrically, this song is definitely one of the groups strongest sounding a wake up call to the singer and anyone else who will listen. The video is a bit bizarre but, the face-painted children and tug-o-war wrestlers somehow seem to make sense with the song. Check it out above, and look for their upcoming album February 24th. To Kill a King has been one of my favorite new bands of 2012. Their music is unique, beautiful and diverse folk-rock. And we were first introduced to them through the Ralph’s Balcony Session, “Choices.” But recently, the entire Ralph’s Balcony Sessions were released on bandcamp. This is a truly amazing collection of music and artist. There are 19 songs, each featuring another artist playing along with the band. Not only is this a great way to hear a bunch of new and fantastic bands, but it is great to watch and listen to how these musicians interact. Different personalities and styles make each song different from the next. Above is one of my favorites from the session called “We Used to Protest.” It features the whimsical Emily Wood, who soft-spoken voice fits perfectly with this stripped down To Kill a King Song. Check it out above and download the whole album on bandcamp, it’s well worth it. Hey folks, sorry for the delay. I know it’s been a while since anything has been posted. It’s been a hectic week, but we’re back with a vengeance. Today we look back to a band that we featured recently called To Kill King. On monday they released the music video for the debut song on their amazing Word of Mouth EP. “Howling” is an impressive stop-motion film made non-stop over a weekend in an apartment. It features the singer and his bandmates as lights shine around them, people party and the camera twists and turns. On top of that, the song itself is a powerful folk-epic, shifting from a quiet night time ballad to a full on rocker. Check it out above and if you haven’t yet, download their EP.